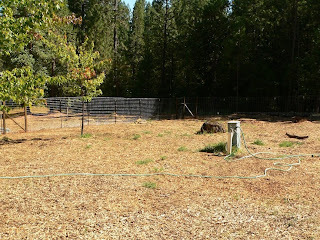 I seem to be drawing a blank when it comes to posting something on the blog. Distracted by this and that, weird things that shouldn't matter, but somehow do. We're okay. Roger's appointment with the oncologist did not answer any questions. The doc is being very cautious and wants to wait another week before deciding if Roger should continue with the Xeloda or move on to the 5FU and Leucovorin. There's really been no change with his rash, so it's hard to tell what's up and why. So, we've been distracting ourselves with work in the garden; keeping our little kale, chard, and onion starts from baking to a crisp in the early autumn heatwave; taking cool morning walks, scaring the band-tailed pigeons from their roosts. I'm also still learning how to use the camera. It's challenging, to say the least. This photo of the quail is taken through our kitchen window. Such elegant birds. But what's also been bugging me to distraction is my high school class had its 40th reunion this past weekend, and I didn't go. It was in New Jersey, and I am not there and haven't been since graduation in 1970. It probably didn't help that we moved so far away from our roots all those years ago, so that there has never been one moment in 40 years where I ran into a single one of these people... not at a grocery store or the park or out on the trail. Some of my former high school classmates are Facebook friends, so I've been seeing a lot of photos of the reunion parties. Looking at all of those faces again, something happened that I did not expect, they made me sad. They reminded me that I was not close to them all those years ago, and not only that, but that my brother, sister, and I were pretty much outsiders. One day we were regular teenagers and then we "turned on, tuned in, and dropped out." It's true. Who knows why it happens? Why someone hears a different drummer from the rest. But it does happen. (How did Roger find The Realist when he was in high school, when it was very first published; or why was he drawn to San Francisco for jazz and the Beats in the late 1950s?) My twin brother put on bell-bottomed pants in 1968 (which at the time was a statement of outrageous provocation). I was sent home from school for wearing a skirt too short. We let our hair grow; we painted flowers on our bodies; we protested the war in Vietnam; we got high and went to the Fillmore East to hear rock and roll; we made friends with other outcasts and wrote poetry about our plight. When I looked at the high school reunion pictures, my heart sank. I remembered that these kindly old faces did not protest the war. They did not go to Woodstock. They did not hear the drum we heard. They held pep rallies. They went to football games. They went to the prom and to graduation. We might as well have been on different planets. Yes, they were my high school cohort, but they were not my tribe. For a few days, those photos and memories made me feel like a lonely 17 year old girl again. Maybe the 40th reunion of Woodstock last year was the real reunion for me. Sigh. Here is a photo we took of Jupiter orbiting 365 million miles from Earth. There's something crazy about looking up into the sky and seeing this shining orb and knowing that it is the LARGEST planet in our solar system. We took a look at it through our little binoculars and saw three moons. THREE MOONS! There we were looking at our harvest moon and three of Jupiter's moon, and were incredibly delighted by this one night on earth. So, we waved good bye to summer and hello to Jupiter on the same night. Are we lucky, or what? In other news, Roger is on his week off from chemo. He has a rash that his oncologist thinks is not a side effect, but an allergic reaction. He's going back to see the doc on Monday when he will determine if Roger can proceed with his second set of treatments or go on to another protocol. In the meantime, we have been to the "big city" to get my computer fixed. The wonderful young man who worked with us admired my desktop photo (it's the new header on the blog). I showed him a pic of one of the bobcats we've photographed. He told us when he's not working the help desk at Apple he's an NFL photographer for the Oakland Raiders. And not only that, he's from my home state of New Jersey. We shook hands. What more can I say? I gave him so many people, I think he must have given me Joe Montana. Ha ha! Life is funny. Roger has started feeling some side effects of the chemotherapy. Some skin rash and malaise. According to him, it's not awful, and it hasn't slowed him down at all. He still has three more days of chemo before he gets a week off. Our mantra is, "so far so good." The oncologist told us he is not adverse to lowering the dosage, if discomforts levels rise. I started to wonder what it would be like for Roger to do ten days on and ten days off, instead of lowering the dose and keeping the routine at two weeks on, one week off. Appointment with the oncologist on Monday, we'll ask him all kinds of questions. We bought a new camera last week. It was a crazy impulse buy, but we're still glad we did it. The old camera was five years old. It was starting to be less reliable, although the photos were still okay. Something was off, maybe it was the photographer unwilling to admit aging eyes and a shakier grip. (That photographer is me, LOL!) So, we bought a Lumix DMC FZ35. It's their 2009 model, and we got a pretty good deal, one our budget could almost put up with. (Have we mentioned how expensive medical care is even with Medicare? Oy.) I'm learning how to use the camera, but it's much harder this time than it was five years ago. Geez, aging is an ongoing annoyance. I love how close this new camera lets me zoom on its "close-up" setting. Someday I'm going to learn how to shoot like a real photographer, instead of point and click. Until then, this is really fun. I did a post five years ago on September 17th. Same day, and now the 40th anniversary. I have no words of wisdom. Life goes on. Once I was 18, now I am 58. Same heart beating. So, while Roger was talking to the good people at Apple about why my two-year old computer would not reliably start up after a system upgrade, I went for a short walk down our little dirt road. I was looking for distraction and nothing in particular. This feather with an orange quill caught my eye. Have you ever seen an orange quill like this before? I had not. When, after several long hours, my computer finally started back up, the first thing I did was google orange quill, then orange calumus, then orange quill bird feather... Nothing meaningful emerged. What to do next? I love answers. So, I emailed the very wonderful and knowledgeable Julie Zickefoose. I hadn't even photographed the feather yet, just sent her a brief description and within an hour I had this response: You found a flicker feather--probably a tail feather--from the intermediate morph called the "gilded" flicker. There's red-shafted in the West and yellow-shafted in the East and in between there's a gilded flicker. It could also be a red-shafted flicker feather. You can check the ranges against where you are. Now you know why we love feathers and JZ, because the world is simply a more beautiful place for their presence in our lives. Roger is on Day Nine of Chemo. So far no side effects, as his excellent oncologist predicted. We'll know more next Monday, when he'll have completed two weeks and will have blood tests and an appointment with the doc. In the meantime, we've planted kale, chard, and onions. We're waiting for cooler temps to plant the garlic. We're planning for a delicious future. 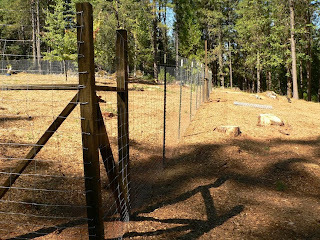 sixteen wooden fence posts, twenty-five steel posts, three hundred feet plus of field fence, four gates, six pounds of fence staples, two pounds of screws, empty ump fence clips (affixing fence to steel posts), and a partridge……oops. we paid a local guy with a tractor to do drill post holes for the wooden posts, and some local muscle (nice fellow with brains too) to do the heavier work of setting posts. 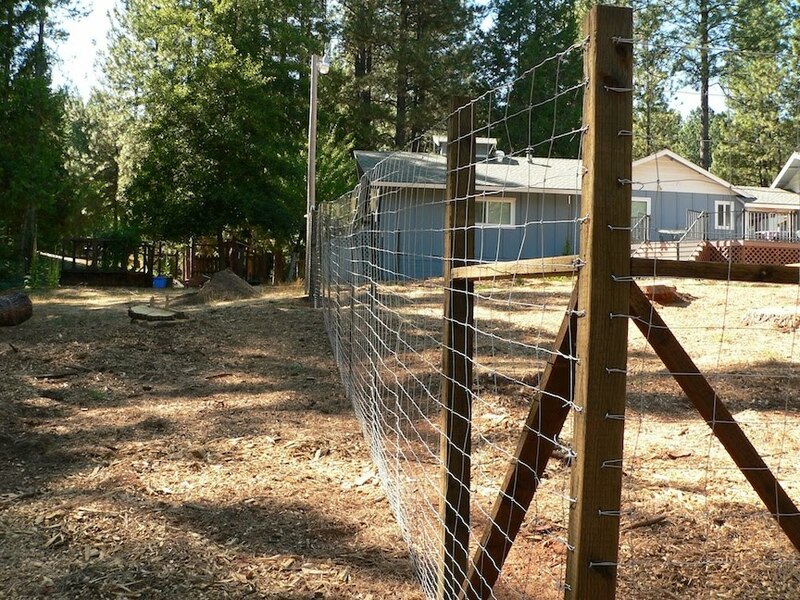 in an earlier part of my life i put up or fixed fence to keep animals in. sheep, goats, pigs, chickens. this fence, like the previous one in port townsend, is to keep out deer, coyotes, rabbits, and skunks. and anything else that threatens the garden or the cat. or us. there will not be any animals leaning on it. no goats climbing it. no rams butting the posts. 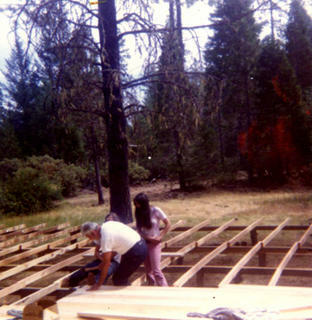 so the construction requirements are less rigorous. still, the posts have to be solidly planted and just unrolling field fence is a chore. 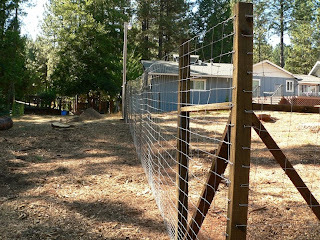 there are 26 horizontal wires and good fence building does require at least one staple for every wire at corner or end posts. (am i whining?) it was good exercise, and is done. 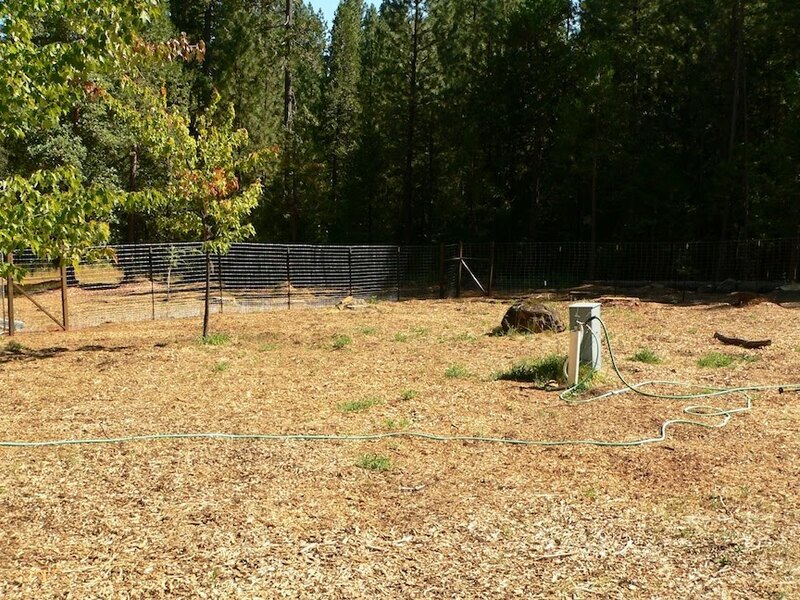 now we can start a real year round garden. 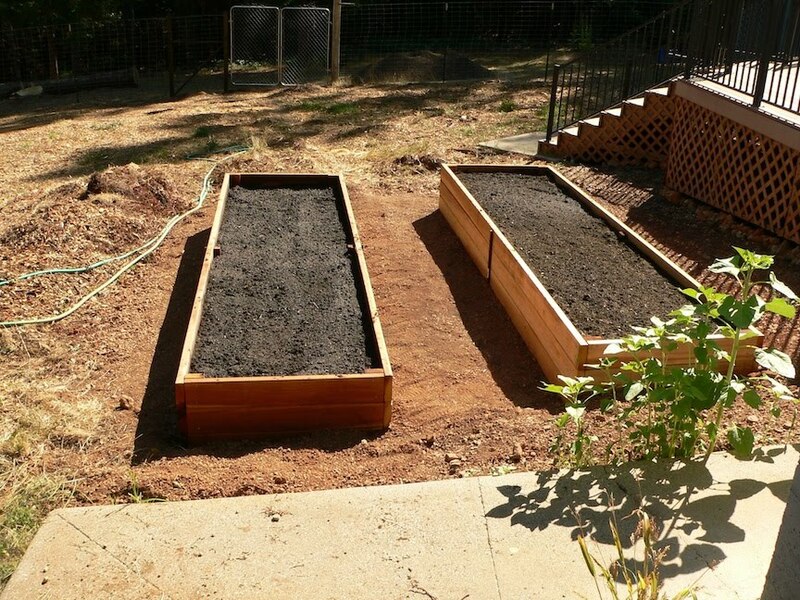 beds ready to plant. the sunflowers in the foreground are volunteers from seeds the birds scatter from a feeder just out of the picture. The oncologist was absolutely right. No side effects yet. Roger is doing very well. If there are going to be side effects, they will become apparent at the end of the second week. So, we're going to buy winter veggie starts tomorrow. 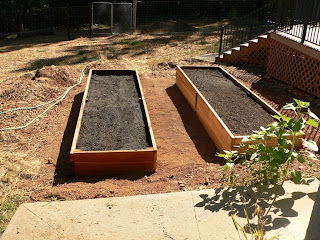 The first raised bed has been filled with the good soil, and the second one has been built and is ready for the wheelbarrows of the good stuff. We've been out hiking. We've been watching old movies (The Front, with Woody Allen; The Fly with Jeff Goldblum). We've been following the "burn the koran" drama. As always we are out of step with the conventional wisdom. Our philosophy says, burn 'em all: the bible, the koran, the flag, bhagavad gita, etc. You name it, we say burn it on the altar of reality. We trust the constitution and therefore trust that it will protect everything else that is important. "When fascism comes to America, it will be wrapped in the flag and carrying the cross." 1935 in Sinclair Lewis's It Can't Happen Here. Our good friend Tara is visiting from Santa Cruz, and we're expecting Indigo and Elena too. If it's Monday when you're reading this, Roger is starting chemo today. We're nervous, but ready, especially since the oncologist told us that Roger shouldn't expect side effects for the first two weeks. That's why he gets the third week off, to recover, get necessary blood tests, breathe a sigh of relief. He's chosen to do Xeloda, an oral medication that he can take at home. He wanted flexibility and some sense of autonomy during these sessions. The oncologist said he thought Roger had made a good choice. There is no way to measure if the chemotherapy is working. There is no tumor to shrink. It's more like insurance or like wearing a seat belt. Did that belt save your life? Maybe. It's all about chances. In the meantime, we've been hiking on a new trail out behind our neighbor's place. It's a lovely walk through the woods, along a ditch, and up around the reservoir. It's become our new favorite hike, and mostly because we see the most beautiful red-winged damselflies there. These are things we always love leaving the house for. A beautiful balance to everything else. i have been apprehensive about this chemo thing. long hikes and work in the prospective garden have helped pass the time and build up my strength. also…the oncology doc was most reassuring about working with me as far as adjusting dosage to minimize the "side effects." i had no apprehension about walking in for surgery. modern medicine is sometimes referred to as "cut, burn and poison." i've been cut. now it's poison. no burn yet. on the extra plus side, all of the actual humans with whom we have interacted have been quite nice and wonderfully competent, many charming. so far my experience with "the system" has been good. I didn't know Roger snapped this pic until I downloaded the photos. I'm hanging crepe paper (thanks to Kathy A) on the windows. I add feathers and all kinds of dimensional things to keep the birds from crashing. 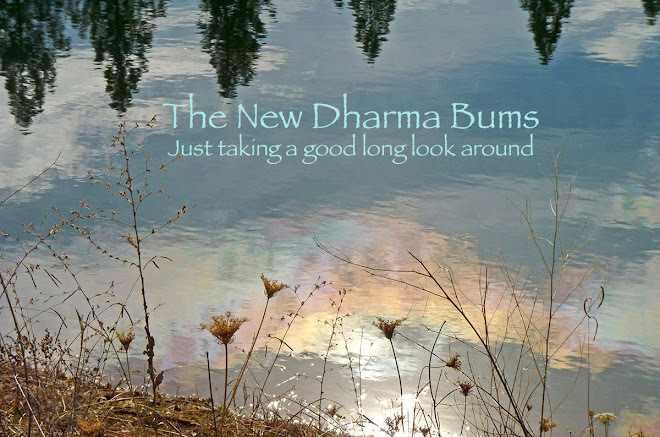 It really works, and we don't even mind looking out through the craziness. If I knew good idiograms I could send the world a message....mmmm... what would it be?